We’ve been beta-testing the site with some friendly freelancers for a few weeks now, and we’ve been slowly adding and tweaking functionality based on their excellent feedback. As we’re growing our features list and building out the product, I wanted to share a little bit of background about why we’re building this and what we hope to achieve with it in the future. Between us Paul and myself have been freelancing, contracting, and/or consulting (however you choose to describe it) for over 15 years. We’ve both experienced being on long term contracts and short term contracts. We’ve both been on contracts that start out as short term, and roll on and on becoming more and more long term, and vice-versa. We both understand why as a freelancer whenever you’re working for a client you have one eye on where the next client is coming from and when you’ll need to start thinking about finding them. Your availability can change at the drop of a hat – trying to keep recruiters and potential clients aware of your current or future availability takes a lot of effort. We believed there had to be a better way of letting everyone know when you’ll be free for new work. So we started building NEXTFREE. We want to help freelancers get found in a much more timely manner than is currently possible. In a perfect world, you should have your next role lined up before you finish your current role. In a perfect world, recruiters wouldn’t waste your (or their own) time by chasing you when you’re already fully booked, and will be for months. In a perfect world, communicating your availability would be as simple as updating Facebook, or sending a Tweet. This is what we’re aiming for. We’re starting with our simple site, but there’s more to come. We want to make NEXTFREE the default place for freelancers to update and share their availability with the World – not just through our website, but anywhere. We want recruiters, both in-house and in agencies to use your availability to better plan when to approach you and when not to. We believe that there is a lot of room for improvement when it comes to how freelancers, clients and recruiters communicate, and that NEXTFREE can help to make that communication better. We believe that sharing your availability should be easy, done in one place, take no time at all and be broadcast where ever you need it to go. We believe that there are already too many places to maintain your professional presence, profile and portfolio online. We don’t want to add to your update overhead. We’re not looking to replace existing tools. We want to simply help you share your availability, even publishing it in some or all of those other tools if you’d like (one step at a time though…). We believe that when you’re working you should be focused on your current client and not be worrying about, or wasting time, responding to badly timed approaches about availability. We believe that poor recruiters are poor recruiters, tools can’t change that, but well designed tools can encourage better behaviour and help great recruiters be even better at what they do. We believe that there are some great recruiters and HR managers out there who would like to be even better. We believe in doing one thing really, really well and not trying to be everything to everyone. We know we can’t make everyone happy, and that’s okay. So, that’s NEXTFREE: the “as simple as possible” way of telling the World about your availability. 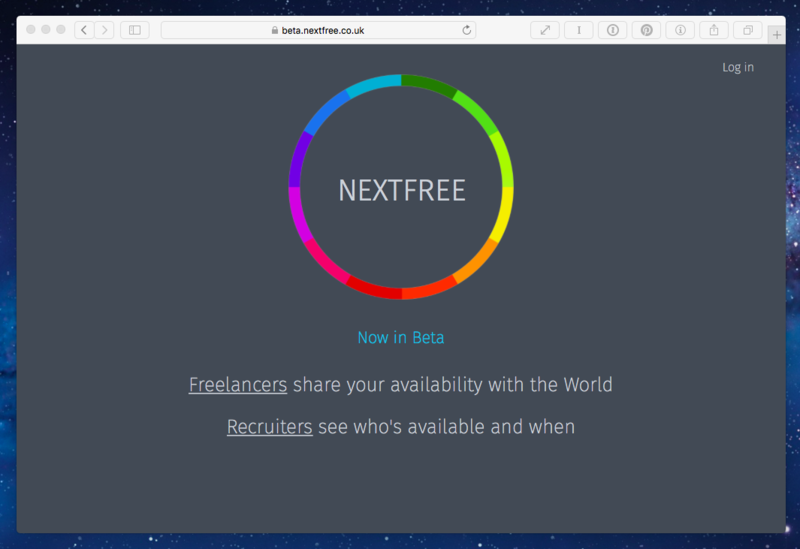 Next week I’ll write a bit more about the details of how NEXTFREE works from the point of view of a Freelancer. Until then, if you are a Freelancer and you haven’t yet signed up for an invite to our Beta program, you can sign up at http://nextfree.co.uk. You can also keep tabs on what we’re doing by following us on Twitter at: https://twitter.com/nextfree. If you have any questions or thoughts about NEXTFREE get in touch, I’d love to hear them.